Based on Loyd #34. 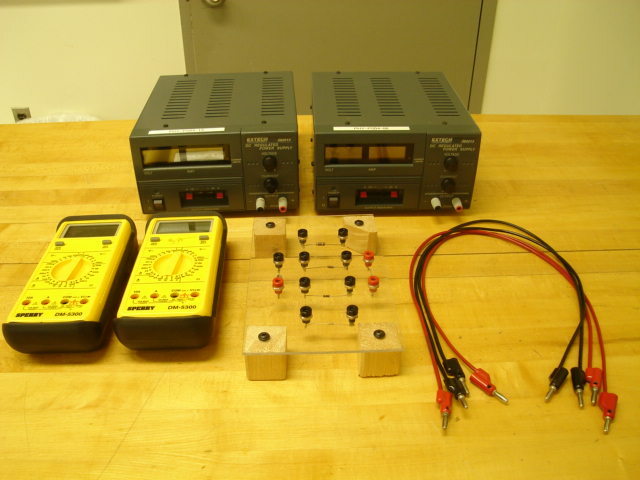 In this experiment, the students will construct and measure the voltage and current of multiloop circuits with multiple resistors and sources of emf. This will demonstrate the type of circuit to which Kirchoff's rules must be applied. The students will apply Kirchoff's rules to several circuits and solve for the expected currents in the circuit. They will then compare their measured experimental values of the currents in the multiloop circuits with the theoretical values predicted by Kirchoff's rules. Remember to put out 5 red and 5 black patch cords per table. Put out the Extech power supplies. If there are not enough, use the Sargent-Welch power supplies. Also, put out the smaller Kirchhoff's Law Circuit Boards found on S56, not the larger ones. Item modified on 2009-07-29 13:13:55 by camaratam1.